Skyline Events: Are you a thrill seeker? If you would like to try skydiving or a fantastic skydive for charity then by raising a minimum sponsorship amount you can receive your skydive for FREE! Find information on how you can benefit by raising funds for Family Friends through parachuting and skydiving. Book online now! 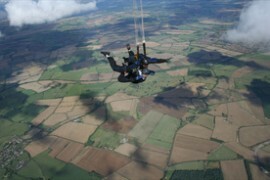 One of our volunteers did a parachute jump on behalf of Family Friends a couple of years ago. This is what she said about her experience, “After a conversation with Philip one day about how tight funds were for Family friends I decided I could perhaps do something to raise money. I had read on line that you could do sky diving for charity and thought this would be great to do as I’m a thrill seeker and I thought people would probably dig deep as its not your average sponsored event and they would probably rather it be me than them. It was very scary going up in the plane but I thoroughly enjoyed it and it was my pleasure to raise money for such a worthwhile charity! An easy way to raise funds for Family FriendsA bunjee jump in aid of Family Friends! A bunjee jump in aid of Family Friends!